features rib knit trim along neckline and cuffs, curved front and back shoulder yokes, logo tape details, an open back vent, and a full snap front closure. 3 roomy pockets include 1 upper chest pocket with a double pen slot and 2 front side entry pockets. 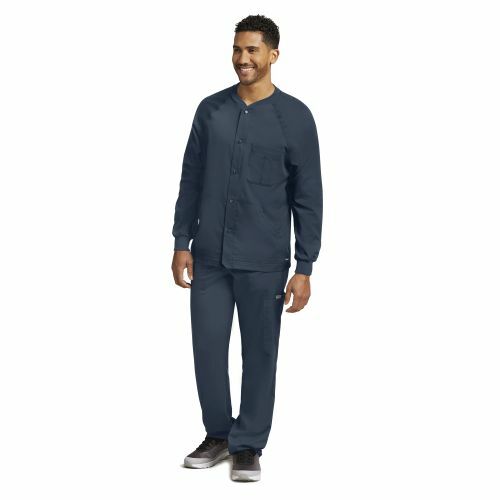 Approximate length - suze M - 29"
The Grey's Anatomy Men's 0406 Warm Up Scrub Jacket features rib knit trim along neckline and cuffs, curved front and back shoulder yokes, logo tape details, an open back vent, and a full snap front closure. 3 roomy pockets include 1 upper chest pocket with a double pen slot and 2 front side entry pockets.